Memorial Day to Independence Day–the best 6 weeks of the year! Longest days and mostly comfortable temperatures. Schools end and vacations begin. And I get to open my pool. Let’s spend a bit of time on pool safety. First, by code all backyards with pools must have a fence with a self closing and self locking gate that opens out from the yard. Beyond this, the American Academy of Pediatrics strongly advises that all pools–above and below ground–be enclosed on all 4 sides by a fence, completely separating the house from the pool, and necessitating effort to be made to go from the house to poolside. This is an important safety measure to limit the risk that a small unattended child might gain access to the pool area. Note that there are a number of alarm products on the market that can be set to go off if an unattended pool is entered, like by a young child who accidently wanders into the yard by himself and falls in. While these alarms can be of some use, they are not a subsitute for the 4 sided safety fence. Of course, children should never be left alone by a swimming pool even for a second. Another poolside safety issue is the blue plastic “solar covers” used to maintain a more comfortable water temperature and limit heating costs for your pool. I am not necessarily advising against them. But strong caution must be accompanied with their use. Not only small children, but pets or even strong adults falling onto them can become quickly enveloped and tangled in them, become incapacitated, and drown. So please be aware. Finally, a word about “boards.” The rule at the Geneslaw pool has always been “no head first entry anywhere, anytime.” So when my kids’ friends would point out–“but Dr. G, you have a diving board…” my response has always been–“it’s not a diving board, it’s a JUMPING board.” The deep end of your back yard inground pool is simply not wide enough to accomodate such activity, in my opinion. Strong young adolescents can easily launch themselves–even without the board– well beyond the “safe”/deep area and hit their heads on the bottom, sides, etc. In particular teenage boys at a “pool party”–out to impress the girls–will first blur and then obliterate any arbitrary line where”it’s ok to dive here but not there” and will soon be going in head first EVERYWHERE. And don’t even get me started about pool slides. Somebody is going to try and show off, climb to the top to dive off. So not a fan. We’ll talk more pool safety next time. It’s the summer–ENJOY. Recently I was asked to comment on alternate immunization schedules. Having addressed immunizations previously; truthfully it wouldn’t be too hard to devote the entire blog to this subject. Let’s review a few important points. The above chart is a few years old, but it makes an important point: each vaccine preventable disease had peak occurrence before the introduction of its corresponding immunization. The “anti-vaxxers” claim that it is “improved public health standards” rather than the vaccine that caused the above change in disease occurrence. But this is completely circular logic. The immunization is the public health standard. If public health stardards like cleaner water, better hygiene, improved nutrition, new medications, or healthier lifestyles were responsible for the great drop in infection rate, then all diseases would become less common at the same rate and at the same time. But that is not what happened. Rather, pertussis dropped in the 40’s, polio in the 50’s, measles in the 60’s, chicken pox in the 90’s and pneumococcal meningitis in the 00’s: each one immediately following the specific immunization’s introduction. The correlation is clear and the conclusion inescapable. The shots did it. 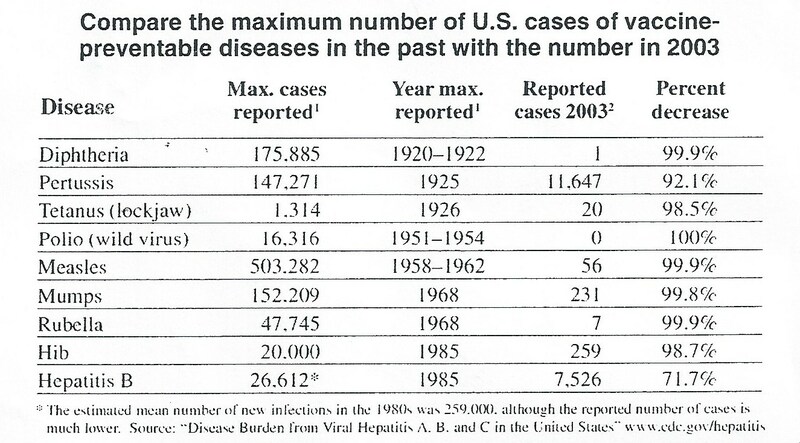 Also recall that most of these diseases still occur with some frequency worldwide. Like most Americans, I value living in an open society with the ability to move about freely. But as Spiderman’s Uncle Ben told him, “with great power comes great responsibility.” We must protect ourselves–and in particular our most vulnerable fellow citizens, very young children–from the infections that can be born by people on the move. Given the huge upside noted on the chart and the very positive benefit:risk ratio its a small price to pay. Another anti-vaxx assertion is the “wait” argument: start the vaccines later, they say, when the children are “stronger.”This is an equally specious assertion. As it is the youngest children who suffer the most from these diseases, putting the shots off until later in life only leaves those most vulnerable at greatest risk. That’s not circular logic–its counter-logical, completely backwards. To protect the youngest at greatest risk we must immunize them. Finally, we should consider the “stretched out” schedule. 2 “cons” and a “pro” here. The scientific evidence for any immunologic benefit is completely lacking. Also, we must keep in mind that every car ride and every doctor visit carries with it a hypothetical but demonstrable risk of accident on the road or infection from office contact. So, given the phantom benefits vs. real risks, this seems kind of pointless to me. Having said that, I do feel that those risks are very small; the advantages of greater trust and assurance for those parents requesting such an approach is a real benefit that deserves consideration. I am very comfortable making reasonable adjustments whenever asked. So I always urge my patients: bring your immunization questions and concerns to me. As the Beatles sang “We Can Work It Out” (you know I love quoting Lennon and McCartney). Having discussed tick bite prevention, let’s now turn to lyme disease. Lyme is an acute infection caused by a strange, primitive bacteria strain called “Ricketsiae” named “Borrelia Bergdorfii” and spread by infected deer ticks ( in the East). It is mostly an April-October affair with 50% occuring in June-July, incubating for about 11 days after the bite(range 1-55 days). 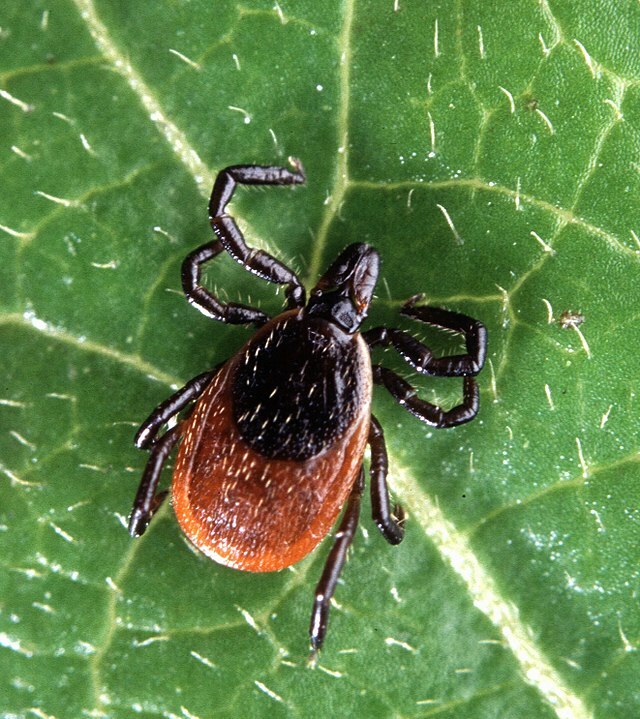 Note that there are some credible reports of symptom onset years after the tick bite. When ticks land on hosts they are programmed to seek a warm moist area where blood flow tends to be most generous; thus the prediliction to find ticks in the groin and armpits. Recall from my last post that a tick needs to be engorged from > 36 hrs of feeding on a blood meal to transmit the infection–little guys, especially those simply crawling on the skin, are no risk. The classic marker for early lyme disease, present in 60-80% of infections is “erythema chronica migrans.” The name is descriptive (as I often say, doctors like to use big words so we can charge more! ), so erythema=red, chronica=lasts a long time, migrans=spreads. Lots of insect bites give you a red “splotch” for a few days. That is not significant. This lesion lasts at least a week or so and grows to at least 5 cm in diameter. Now, the clinical course of lyme can have a variety of manifestations. Early on people have the above rash with fever, head and neck pains, joint and muscle aches, and fatigue. Sometimes a child may develop multiple ECM lesions(15%). Note that lymes infected children are sick. Vague complaints of aches and fatigue in generally well, active children are not symptoms of lyme. Untreated, lyme can have many complications: neurologic (Bell’s facial palsy almost 50%), arthritis (10%) and cardiac rhythm disturbance (5%). Mostly these are unusual occurrences in children when treated promptly. It is not uncommon for the fatigue and aches to persist for weeks even after successful treatment. The serologic test for lyme is quite inexact. There are frequent false positives( test inaccurately says yes) so routine testing after tick bite in the absence of specific symptoms is not recommended. Also, after actual infection the antibody response can remain positive–perhaps permanently–so repeat testing to assess for resolution of infection is unhelpful and counter-productive. Treatment for lyme is antibiotics–typically 3-4 weeks orally for early infection and less serious complications like Bell’s palsy. More severe neurologic problems(meningitis), severe arthritis, or cardiac problems require IV medication. The AAP does not recommend treatment for > 4 weeks. No credible advantages for prolonged treatment have been demonstrated. Side effects, complications, and financial advantages for those advocating prolonged treatments have been reported. Last point: to avoid sun risk, limit mid-day outdoor activity; limit insect bite risk with no early or late outdoor activity. But don’t stay indoors to avoid sedentary life and obesity. What to do? Don’t completely ignore me: moderation in all things. Not too much sun or too much around thick vegetation or standing water. But its the summer: so go out and have fun. Questions or comments? And thanks for following. Time to get out and enjoy the warm weather. That means, of course, concerns about insect bites generally and especially tick bites and lyme disease. Let’s take some time to consider these topics. First, let’s keep in mind that ticks can cause a variety of potentially serious ailments besides lymes: babesiosis, Rocky Mountain Spotted Fever, Q fever (caused by bacteria called Borellia), as well as erlichiosis and tick born paralysis (caused by tick produced toxin). Please be reassured that these are all unusual and typically treatable problems. We should also keep in mind that it is actually quite hard to contract these infections. A tick must be attached for > 36 hours before the transmission of lymes occurs, so the infection rate for lyme is only 1.2-1.4% even in areas where the disease is common. Erlichiosis infection rate is 1.8%. This is what lyme causing ticks look like. Wear long sleeves and pants when weather permits. Use gentle, firm, steady traction to remove insect. Don’t bend or twist. Don’t cover tick with vaseline to smother it. They are pretty hardy critters. Some studies suggest that they can live weeks without oxygen. The goal is to remove the tick promptly. Please don’t forget that only ticks that are embedded in the skin can transmit infection, and usually those should be engorged with blood. Little buggies crawling along on your kid’s skin are not any risk. There is more to address on this topic, so we can return to it next time. Please send along questions or comments, and thanks for following.